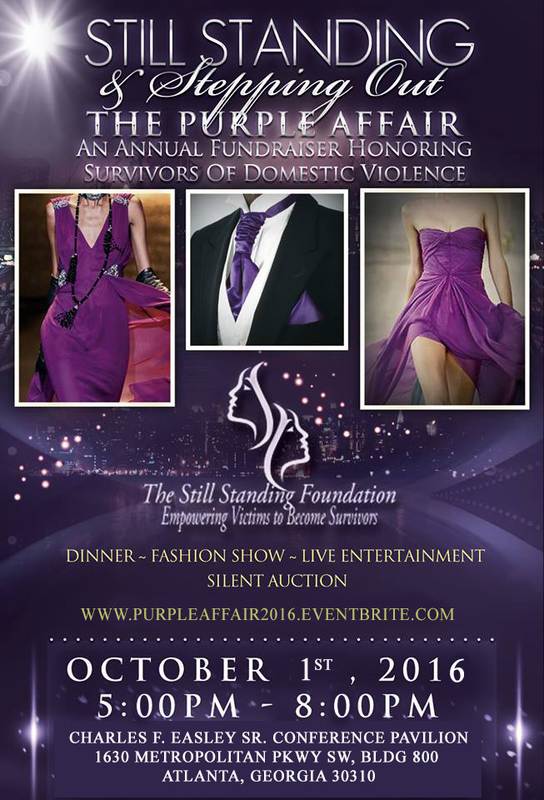 On October 1, a diverse and philanthropic group of Atlanta media, professionals, celebrities, advocates and influencers will assemble to pledge their generosity and ongoing support of domestic violence survivors during the 5th Annual Still Standing & Steppin Out, 2016 Purple Affair Fundraiser hosted by Fox 5’s George Franco. Created by Author, Life Coach, Speaker, and Domestic Violence Survivor/Advocate Tamiko Lowry-Pugh, this year’s event is expected to be yet another night to remember. With much success in previous years, the 2016 edition will treat guests to light fare, live entertainment, poetry, celebrity appearances, a silent auction and exciting fashion show in which survivors of abuse will will showcase various style trends on the runway. Attendees will also hear from this year’s ambassadors April Kelley, Nikki Payne, Dr. Alexcius Branch as well as Keynote Speaker Dr. Sonja Brown. Key event sponsors include State Farm Agency & Erika Mitchell of Metro Brokers.